For an eSports professional, it’s crucial to have a controller that effortlessly adapts to any situation. 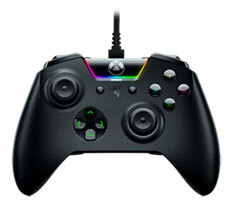 Razer's goal was to achieve that - and they went beyond. By optimizing ergonomics for comfort and adding a whole suite of features, they’ve mastered the controller made for tournament play and triumphant wins. The Razer Wolverine TE comes loaded with a slew of extra buttons for advanced gaming 4 remappable multi-function buttons. Now you’ll have ultimate control at your fingertips.